My company is built around positively contributing to society. 38% of businesses in our survey selected strongly agree to this question. 25% of the respondents have annual revenue of $5 million or more. An additional 39% have revenue between $1 million and $5 million. 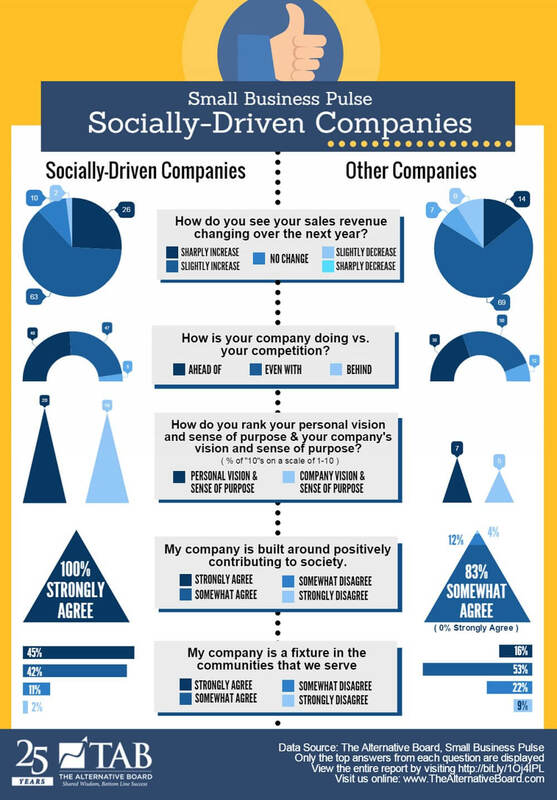 Here are some key observations from those companies that identify themselves as socially driven companies compared to those that do not. There may be a perception that owners of socially driven companies are run by younger owners. That’s not true. In fact, the average age of owners of socially driven companies (57.1 years) is slightly higher than those of other companies (55.1 years). Another misperception about socially driven companies is that they only exist for the greater good and aren’t that interested in profits. This is not true either. When asked which response best describes your company, only 25% of socially driven companiesselected “a business for good”. This compares to 14% of other companies. This is a big difference. 31% of socially driven companies selected “a business for profit” compared to 42% of other businesses. businesses are “for results” or “for profit.” At the end of the day, they are still profit-making businesses where the owners manage their businesses to achieve results. When we asked respondents about how their revenue changed over the past year, the results for socially driven companies and other companies were very similar. But, when we asked them In one year from now, how do you anticipate your sales revenue changing? the results were substantially different. Nearly twice-as-many socially driven business owners expected revenue to sharply increase (26%) compared to 14% of other companies. companies expect to grow revenues compared to 83% of other businesses. While only 2% of socially driven respondents anticipate a decrease in revenue over the next year, 10% of other business owners anticipate a decrease. These are very significant differences, especially those owners expecting sharp increases. Some of this difference can be attributed to differences industries with less socially driven companies in manufacturing and construction. However, these differences are significant enough to conclude that socially driven business owners are generally more optimistic about future growth prospects. Does a Socially Driven Company Have a Competitive Advantage? We asked business owners Today, how is your company faring against the competition, overall? 48% of socially driven companies selected “ahead of the competition” compared to 38% of other companies. Only 5% of socially driven companies felt they were “behind the competition” compared to 12% of other companies. This finding also reflects potential optimism of socially driven company owners. However, owners of socially driven companies are likely to see their social purpose as being an important distinction compared to their competitors and therefore a genuine competitive advantage. 20% of socially driven owners selected a 10 when asked “how would you rate your own personal vision and sense of purpose” compared to 7% of other owners. Other owners more commonly selected 7 or 8 for the strength of their personal vision. 19% of socially driven owners selected a 10 when asked “how would you rate your own company’s vision and sense of purpose” compared to 5% of other owners. Other owners more commonly selected 7 or 8 for the strength of their company vision. One of the strongest differences in the survey was in response to the question My company is a fixture in the communities that we serve. The following compares other select responses between the two types of companies who responded to our survey. selected by emphasizing human connections and relations compared to 59% of other businesses. Interestingly, a majority of both types of businesses selected this option over setting goals and accomplishing tasks. This reflects the importance that all owners place on their employees, customers and partners. businesses (69%): My company pursues win-win relationships with customers, employees, partners and other key stakeholders. businesses (55%): My company listens closely to what our stakeholders think of us.